The air rifle is a widely used and popular weapon in Europe and other parts of the world that have restrictive firearms laws. It hasn’t been as popular in the U.S. because of our greater availability of center fire and rim fire weapons. There are some serious air rifles being manufactured now that are a far cry from your Daisy Red Ryder BB gun you had as a child. Are they a viable option for your survival preps? Serious air rifles of various designs have been around for a long time. The Lewis and Clark Expedition reportedly used a Girandoni air rifle in the 1780’s. It used .46 cal bullets and achieved a muzzle velocity of between 450 and 650 fps. It was also issued to the Austrian Army of the period for a number of years. Today, modern air rifles are manufactured that are designed for small and medium game hunting and could be a good addition to your survival battery for a number of reasons. Air rifle are very quiet. This allows you to hunt in either urban or rural settings without notifying your presence to everyone around. They are easy to shoot. The lack of noise and substantial recoil allows rapid learning by novices. Ammunition is much lighter and packaged smaller than even rim fire .22LR ammo. 500 pellets fits a much smaller package than a brick of .22LR. Ammunition has an almost indefinite shelf life, and can be stored in much worse conditions more easily than regular ammunition. They are legal in many places that prohibit or severely restrict cartridge fired weapons. There are basically three types of firing mechanisms for air rifles. Spring and Piston: Cocking the rifle compresses a spring. When the trigger is pulled, the spring pushes a piston forward, compressing air which fires the rifle. PCP (Compressed Air): A large air reservoir is charged by pumping or large compressed air canisters. Many of these rifles have multi shot capability. CO2: These require the use of replaceable small gas canisters. 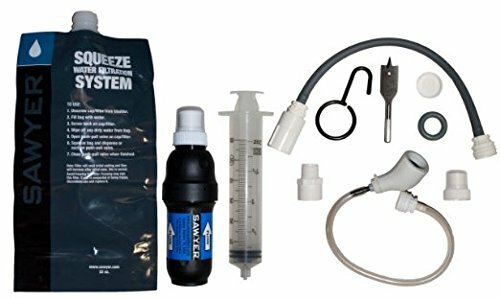 This system would end up being a problem in a long-term SHTF situation once your supply of CO2 canisters was exhausted. From left to right, wadcutter, domed, hollow point and pointed pellets. Top row .22 caliber (5.5 mm), bottom .177 (4.5 mm) caliber. A quality air rifle using good pellets is just as accurate as a .22LR within it’s range limitations of a maximum effective at around 50 yards. Air rifles are legal to purchase through the mail in most states. Amazon has a very large selection of them. is a popular air rifle. It comes with a 3-9×40 mm AO optic from CenterPoint. It is rated at up to 950 FPS (alloy pellets) / 800 FPS (lead pellets) / 23 FPE (foot pounds energy). It is a break open spring and piston design. The Benjamin Marauder is another popular air rifle for small game hunting. It is of the PCP (compressed air) style and can be had in either wood or synthetic stock versions. It is a 10 shot repeater rated at approximately 1000 FPS. Like all decisions on your equipment, your own personal situation will dictate what you find usable and what you don’t. I think a quality air rifle would be an asset in a prepper’s arsenal. It will allow you to harvest small game in both rural and urban environments relatively quietly. They are inexpensive compared to centerfire rifles. The ammunition (pellets) is much cheaper than even 22LR, and an equal amount makes a much smaller package with a much longer shelf life. But I think one of the big advantages to an air rifle is also its training value. They are great to teach beginners on due to lack on noise and recoil. In addition, they have the capability to give even experienced shooters the ability to practice much cheaper and much more often than loaded cartridges. You can easily set up a small range in your basement. As always, do your research and think things through. You’re on the xmas card list my friend. Recoil is a funny thing and with a spring air rifle it’s a forward/reverse SNAP action which beginners find hard to control. Experts often claim a spring air rifle is HARD TO CONTROL because of this “weird recoil” claiming it affects accuracy. Only that’s why they they keep missing (poor dears). The secret IS NOT TO CONTROL IT but go with the flow and let the rifle do it’s little dance. Then all you need to remember is to follow through i.e. stay nice and quiet, in the aim until it all goes quiet. Finally, as you go and collect your supper, remember to have a chuckle at the expense of those experts who can’t handle a REAL weapon! I understand what you you are referring to in regards to recoil. When I was a kid my stepfather bought me a Czech made break open air rifle in .22. I had been used to shooting target .22LR on our high school rifle team and M-1’s at our gun club, so I understood the concept of follow through, so it wasn’t a problem. Great little trainer and I had a small range set up in our basement using a long card board box filled with lots of newspaper. Used to zap bunnies with it in the arroyos east of town (now covered by Federal Penitentiary where they zapped Timmy McVeigh). Really miss that little rifle. Ah! but did it put meat on the table? I’ve always maintained that if you can shoot a springer well, you can shoot anything. It’s how I used to train beginners. Funny enough the girls always outshot the boys on springers. They listened, boys never did as they were always thinking cowboy movies. I had updated my first post. I took quite a few bunnies with it. I have had the same results training females both from the high school level, through the Army, and now as a civilian. You are right. The ladies tend to listen because they do not have the mucho macho baggage. Sometimes the lads have to be untrained first.